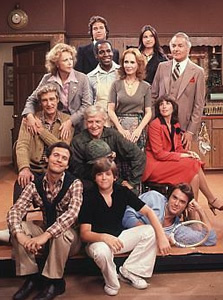 Katherine Helmond, Robert Mandan, Cathryn Damon, Richard Mulligan, Ted Wass, Billy Crystal, Jennifer Salt, Jimmy Baio, Diana Canova, Arthur Peterson, Jay Johnson, Robert Guillaume, Donnelly Rhodes, Sal Viscuso, Rebecca Balding, Marla Pennington, John Byner, Dinah Manoff, Eugene Roche, Roscoe Lee Browne, Gordon Jump, Gregory Sierra, Nancy, Barbara Rhoades, Bob Seagren, Randee Heller, Caroline McWilliams, Inga Swenson, Jesse Welles, Allan Miller, Robert Urich, Howard Hesseman, Charles Lane, Lynne Moody, Joe Mantegna, and Rod Roddy. This groundbreaking serial sitcom, created by Susan Harris, tells the story of two sisters — Jessica Tate (Katherine Helmond) and Mary Campbell (Cathryn Damon). Naive Jessica is part of a rich family which includes her philandering husband Chester (Robert Mandan) and three children; man-crazy Corrine (Diana Conva), snotty Eunice (Jennifer Salt), and often-ignored Billy (Jimmy Baio). Jessica’s senile father, the Major (Arthur Peterson), and sarcastic butler Benson DuBois (Robert Guillaume) serve as consistent sources of humor and commentary on the crazy Tate household. Mary lives a middle-class life with her second husband Burt (Richard Mulligan) and two sons from her first marriage; gay Jodie Dallas (Billy Crystal) and Mafia tough guy Danny Dallas (Ted Wass). One of Burt’s sons, Chuck (Jay Johnson), also lives in the Campbell house. Chuck is a ventriloquist who believes that his nasty and constant companion puppet Bob is a live person. Later characters include convict Dutch Leitner (Donnelly Rhodes), Detective Donahue (John Byner), lawyer E. Ronald Mallu (Eugene Roche), and urbane butler Saunders (Roscoe Lee Browne). The series announcer is Rod Roddy. Jessica has been kidnapped by El Puerco’s enemy and brought back to Malaguay. If El doesn’t return to the island, she’ll be killed. Mary is upset that her baby is likely half alien. After being hypnotized and regressed to a past life, Jodie still believes that he’s an old Jewish man named Julius. The Governor of Connecticut wants Burt to run as his Lieutenant Governor but insists that Burt distance himself from his crazy family. Before he can decide, Burt is lured into an ambush by thugs who’ve been told to kill him. Danny and Annie’s affair is discovered by a despondent Chester who’ll likely soon die in a duel with El. Feeling humiliated, he decides to shoot the pair first. Jessica tries to cajole and convince her captors not to execute her but is unsuccessful. She’s placed in front of a firing squad and we hear the guns fire. The series ends with several unresolved cliffhangers. First aired: April 20, 1981. In September 1983, over two years after the end of Soap, an episode of spin-off Benson gave viewers one last glimpse of Jessica Tate. In “God, I Need This Job,” Benson is very stressed about his job as budget director. It doesn’t help when he finds out that the Tates are trying to have still-missing Jessica declared legally dead. Moments later, his old friend appears to him in spirit form that only he can see. Jessica tells Benson that she needs to find a way to do a good deed that will help get her into heaven. After several bungled attempts, she succeeds in a way that also alleviates Benson’s problems. As the two share a tender farewell, Jessica realizes that she’s definitely not dead but is actually in a coma somewhere in South America. She tells him not to worry because she’ll get out of it somehow, she always does. As she “floats” out of the room, we hear the strains of Soap’s theme song one last time. • When the last episode was filmed, the cast and crew had every expectation that the series would be picked up for a fifth year. Series creator Susan Harris has indicated that, had she known the show was going to be cancelled, it wouldn’t have ended on a cliffhanger. • Prior to the start of seasons two, three, and four, ABC aired 90-minute retrospective episodes that recapped where the previous season had left off. Two of the retrospectives were released on video tape in the 1990s but unfortunately, none of them are included on the DVD sets. Soap was the best, too bad Ronnie and Nancy Reagan killed it & WKRP! what is the name of the theme song for soap? Who wrote it? I remember Richard Mulligan in a series , that I thought was Soap , he died and was carried to a bar by his friends , and eventually they place him in a boat and sent him out to sea. Does anyone remember this? Not a show but a movie. S.O.B., for standard operating bull****, from 1981. It took place in Dunn’s River, CT but was shot in Los Angeles. Would love to see Cozi TV or MeTV pick this up!!! Really surprised neither has. I ordered the l st season of soap to share with a bunch of retired old hags. After all these years it is just as brilliant and humorous as the first time we watched it. We plan a monthly meeting to view each year in the series. I just want Susan Harris to know she is an incredible geneous. Our thanks to her for giving senior citizens a good laugh. I remember an episode where Jessica dies and “argues” with the angel at the gate, played by Bea Arthur, why she needs to return to earth. I’ve purchased the DVD set. But I don’t see this episode. What happened to it? @Jan: That was a recap special that aired between seasons three and four. For whatever reason, the studio didn’t include the recap specials with the DVD sets. The one you’re thinking of was released on VHS many years ago and you can still find it on eBay from time to time.